Sunday, June 5, 2011 marks the 11th anniversary of World Environment Day. World Environment Day is sponsored by the United Nations in efforts to raise worldwide awareness of the environment. This year's theme of World Environment Day is Forests: Nature at Your Service. Families are encouraged to host an activity, register it and join the Wide World of World Environment Day at UNEP.org/wed. One of the ways your family can celebrate and help the environment is to start a kid friendly compost. Creating a compost bin can help teach children how to reduce the amount of biodegradable garbage that goes to the local landfill. Purchase a small (3 foot by 3 foot) plastic tub. Have the kids decorate it. They can stamp leaves on it or paint flowers and write the word compost on it. Place the bin in a shaded area in your backyard. Line your bin with a few inches of clean potting soil. Dry leaves can also be added to the bottom. Talk about the things that can be added to your compost. Fruit and vegetable peelings and scraps are great items to add. These are considered moist or green items. Straw, dry leaves and grass clippings (from chemical free lawns) can also be added. These are considered dry or brown items. Animal matter and bones should not be added. Each time you add moist items to your pile (green items), dry items must also be added (brown items). The idea is to form a layer of moist and a layer of dry matter. To speed up the composting process, always add a bit more brown than green matter to your pile. If your pile seems too dry, add a little water to increase moisture. Once you have a complete layer, turn and mix your compost bin every four to five days. If heat is coming off of the mixture, you know that your compost bin is working properly. After several weeks, once the pile no longer throws heat and there is no recognizable organic matter, the composting process is likely complete. Add compost to your garden before you plant to help it grow. 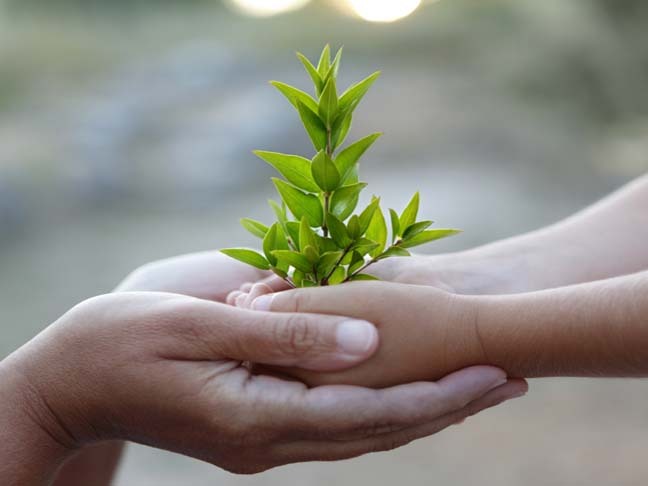 What do you do to help your kids learn about the environment? Do you have a compost bin of your own? We want to hear about it! Share your comments, tips and suggestions below.